You can use a LayoutTransform on individual child elements in a DockPanel container to scale or rotate the elements. In the example below, we have four Label controls, each docked to one side of a DockPanel. The labels on the left, top and right sides use a LayoutTransform to make them face outwards. 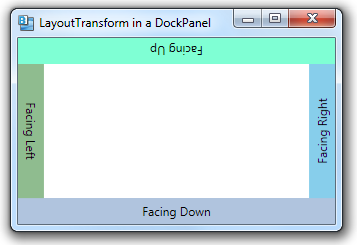 <Label Content="Facing Up" DockPanel.Dock="Top" Background="Aquamarine"
<Label Content="Facing Down" DockPanel.Dock="Bottom" Background="LightSteelBlue"
<Label Content="Facing Left" DockPanel.Dock="Left" Background="DarkSeaGreen"
<Label Content="Facing Right" DockPanel.Dock="Right" Background="SkyBlue"